The miniature on the top left is from Blind Beggar, I picked her up in a Kickstarter. This group is meant to be a ragtag group of alien creature hunters and I wanted several to have missing limbs, and she has two of them. The guy with the heavy webber is a conversion, based on a figure from the old Alpha Forge 'Star Moguls' range. I'm not sure who owns the line now. The heavy webber is my own sculpt- I cast a few in resin. I planned to make all the Rogue Trader weapons that were never released as separates (so far I have a webber, heavy webber, and grenade launcher). The head is resin, from Mad Robot. They make a pack of heads that look like the old Van Saar. 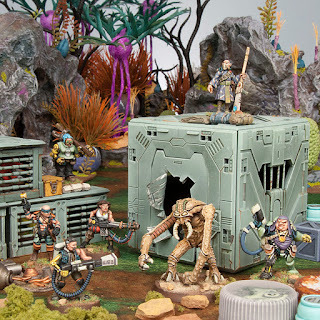 The woman with the autocannon (looks like a flamethrower to me) is an old GW 40K Rogue Trader era figure- she's stock. The man with the warpaint and pistol is from the 'Cobalt-1' line- he's stock as well. The corpulent man with the oddball gun is also from Cobalt, I think they might have been from the same pack, some sort of mercenaries or bounty hunters. He has a new bionic leg (resin, from MaxMini) and new hand (also MaxMini). The figure is cast missing a foot and a hand for some odd reason. The problem with Cobalt is that so many things are weird looking, rounded off, and straight up strange that the missing stuff appears to be on purpose, based off of pictures of the greens. The eldar hunter is a fan sculpt from the 'Collecting Citadel Miniatures' Yahoo group and was cast in limited numbers several years ago. 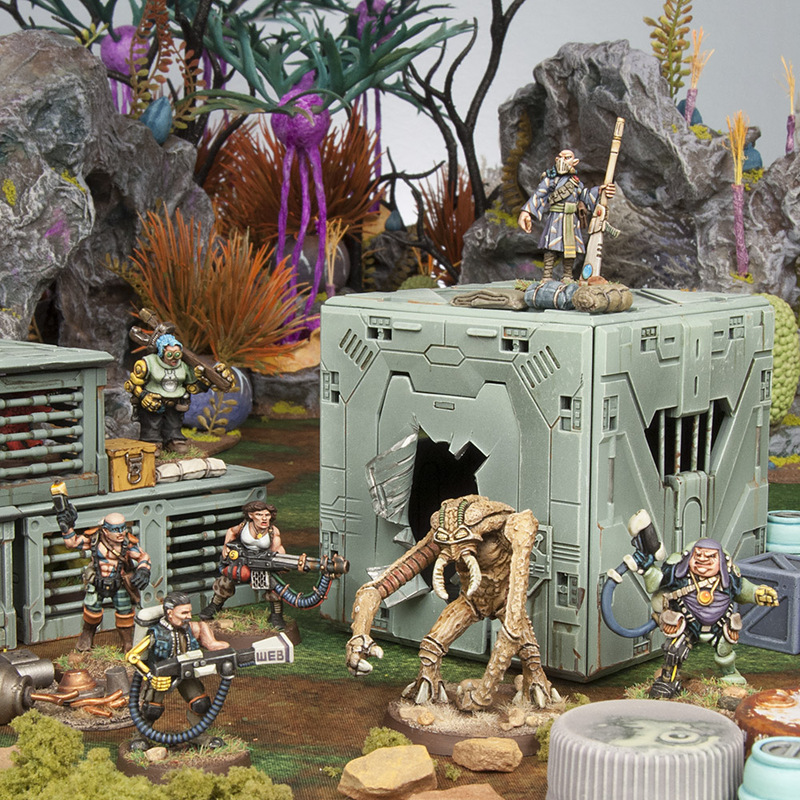 The ambull is an 'Insectoid Crawler' from Knightmare Miniatures. I had another (the old one from GW) primed but I didn't get it done in time. I picked it up in a Kickstarter as well and it's still available. The large creature container is made from Mantic's plastic Deadzone terrain- I added some bars and made a new door to fit. The smaller cages are made from pieces from a terrain Kickstarter ran by Maki Games a few years ago. The tops of the cages are also from Mantic Deadzone, magnetized to be removable so I can put critters inside. I've been wanting to make the cages for quite a long time and wasn't quite sure how to do it until this entry forced me to think about an Ambull cage and I had all the components laid out. This was my final entry of the 2018 LPL, and would determine if I placed third or fourth. I decided to go all in on this one, and it took quite a bit of time. I had the figures set aside for quite a while, and I wanted to make cages for quite some time as well so I ended up using this project for the LPL. I think I completed everything within five days. I also photographed the figures more close up, which seems to me to have been the deciding factor on most of the matches this year. And that's it for the 2018 LPL. Phew!